Apple iSlate (Tablet PC) coming in this January ? It is reportedly rumoured that Apple is holding a media event in San Francisco on January 26 at the Yerba Buena Arts Center, the same place where Apple chief executive Steve Jobs showed off new iPods , where the company is expected to make a major product announcement. I have heard that the Apple tablet will offer a 9.7-inch screen and sell for $800, or maybe a 6-inch screen, and will sell for under $700 and also heard it will feature a 10.1-inch screen and retail for a cool $1000. As if that’s not enough, there’s a 7-inch model (price unspecified) in addition to the 10-inch tablet. The tablet will either run OS X or something like the iPhone OS. It will play HD video, read e-books, and save the newspaper industry. With all due respect, I’d expect any other tablet to do the same. Though this is a complete touch screen tablet, a tablet with a multi-touch feature: It may sound new to the tablet industry, but for the users? Of course this is expected. 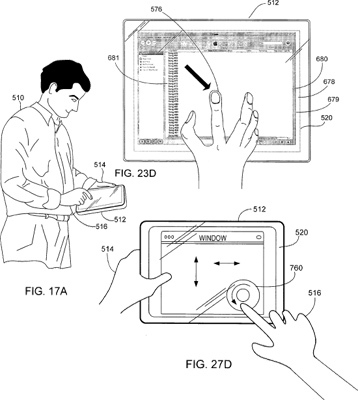 It wouldn’t be the image and likeness of the iPhone without a multitouch feat, wouldn’t it? Looks like the US Design Patent No. D504,899 is one for the Apple history books to add this up, also Apple had acquired iSlate.com, other pieces to the puzzle seemed to fall into place soon or later.